The Lamborghini Gallardo doesn't need much help to grab people's attention, with its beautifully raucous V10 motor under the bonnet, its sharp, wedgy shape and monstrous acceleration. 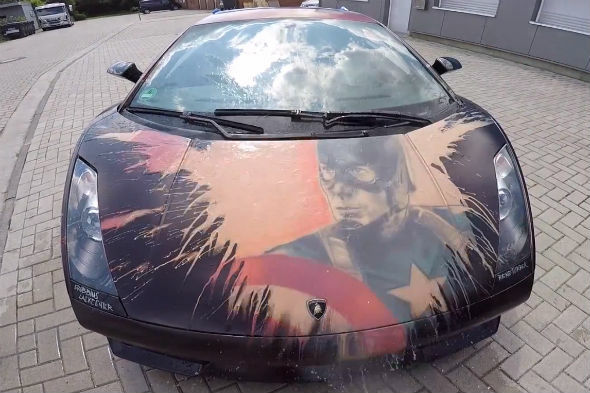 Graffiti artist Rene Turrek, however, has given one Gallardo an extra dose of visual punch, with temperature-sensitive paint that sees car transform from a dull aubergine colour to a dramatic Captain America design. German graffiti-ist Turrek's psychedelic design features temperature-sensitive paintwork that morphs from one flat colour to revealing the intricate Captain America pattern underneath – simply on contact with warm or cold water. Would you personalise a pricey supercar with such a unique design? Let us know in the comments section below.